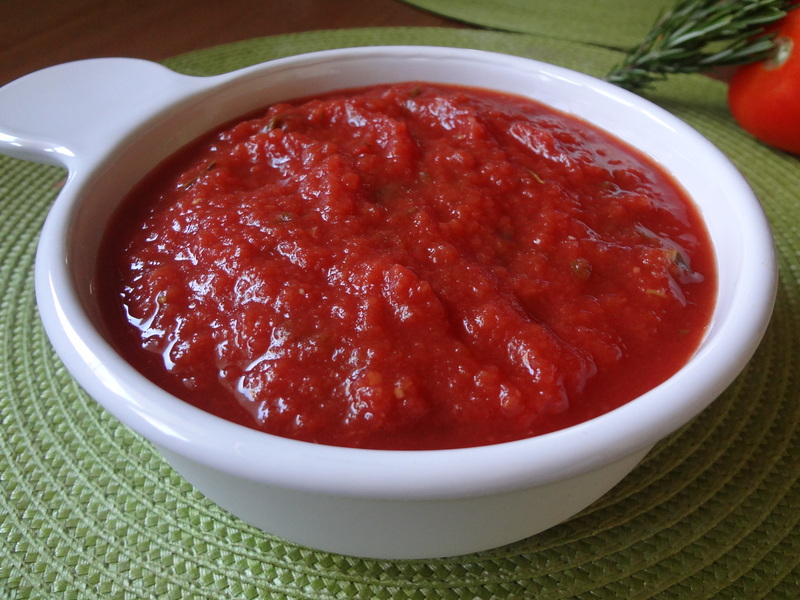 Now, for anyone making sauce for the first time, like I was, I do want to give you a few word of warning. First, it will take a long time. Set aside an afternoon to do it – trust me, no one wants to be stuck de-seeding their tomatoes at 10:30pm. Like I was. Oh well, we live and learn, right? Second, yes it takes a long time, but it’s a really simple process, and it’s worth it. Since there isn’t a support group for first time sauce makers, you’ll just have to trust me. When you’re 20 tomatoes in, and your fingers are red from peeling off the skins, and you’re swearing at me because I talked you into this crazy idea in the first place, just hang in there. I promise, good sauce is on the way! 1. Peel the paper off your garlic, but leave all the cloves intact. Slice off the top of the bulb, exposing each clove. Drizzle with the olive oil, sprinkle with salt and pepper, then wrap it in tin foil and cook at 400° F for about 30 minutes, or until the cloves are tender. 2. While the garlic is roasting, wash and core your tomatoes. To core the tomatoes, insert a knife at an angle into where the stem once was, and cut around it in a circle. The cone-shaped section should then be easy to remove. 3. Bring a large pan of water to boil. Prepare an ice bath in a large bowl and set it on a work surface. Cut a small X in the bottom of each tomato. This will help the skins easily come off the tomatoes. 4. Now comes the time consuming part. Working in batches, place the tomatoes in the boiling water for about 30-60 seconds (depends on the size of the tomato). Once the skins begin to split, remove the tomatoes with a slotted spoon and pop them in the ice bath. Leave them in there for at least a minute to prevent burning yourself later. 5. Once the tomatoes are ready to leave the ice bath, peel off the skins. This should be very easy. If it’s not, let the tomatoes boil and then soak in the ice bath longer. Slice the peeled tomatoes in half the long way, and use your fingers, or a spoon, to scoop out the seeds. This is key – if you don’t take out the watery goo inside you will be cooking sauce FOREVER. 6. 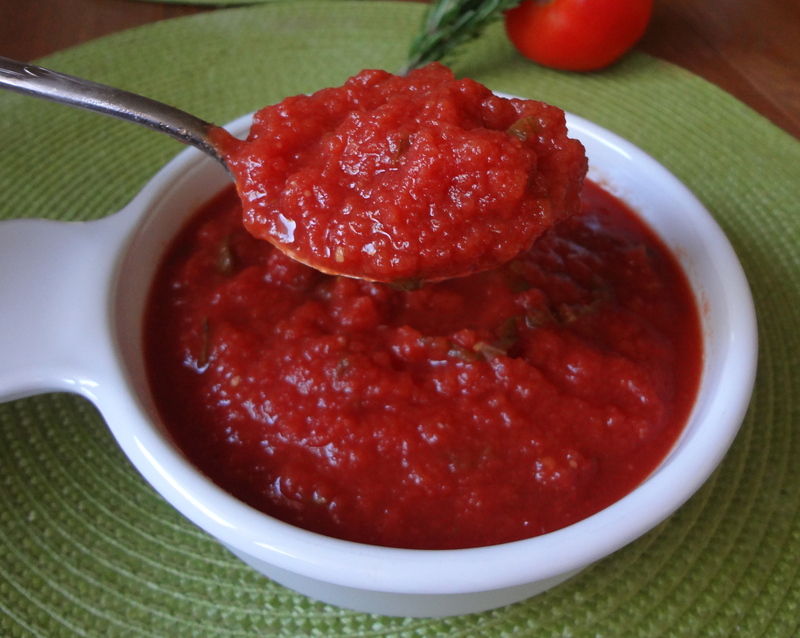 Place the meat of the tomatoes into a blender and continue your peeling/de-seeding process. Once all the tomatoes are finished and in the blender (mine was full to the top), give it a few quick pulses to break them up. Squeeze the roasted garlic form each clove into the blender and blend until combined. 7. Pour the tomato/garlic mixture into a large pan. Set it over medium-high heat, and add in your fresh herbs, the bay leaves, and the wine. 8. Cook for about 30 minutes, or until your sauce reaches the desired consistency. The main point of this cooking process is to evaporate some of the water out and leave you with only sauce-y goodness. When it’s as thick as you want it, remove it from heat and gobble it up or freeze some for later. This entry was posted in Uncategorized and tagged Cooking Light, Dinner, from scratch, Italian, Summer, Tomato sauce, Tomatoes, Vegan, Vegetarian by theculinarycapers. Bookmark the permalink. I was literally JUST thinking about how I wanted to make my own sauce and had no idea what to do. You are a lifesaver. Aww, thanks, Amanda! Let me know how it turns out. Happy sauce making! I agree, very time consuming, but so much better than anything you can find in a store! Thanks for reading!